Faena is a small Greek artisan shaving soap maker. Founded 6 years ago, by Fokion Theodorou, a US university graduate, who left behind the busy corporate life in Boston and returned to his homeland island, Lesvos, in Greece. The island is rich of olive groves, offering one of the best and most celebrated olive oils in Greece and Europe, as well as a plethora of herbs, growing wild in Lesvos nature. Fokion sought such precious ingredients from his island to create a new range of soaps using local organic olive oil. A year later, Faena expanded its business in the male care and shaving products, currently it's integral business, a market that places significant importance to high quality, natural ingredients, such as the ones used by Faena. Faena produce a range of artisan tallow shaving soaps, aftershave balms and a high quality pre-shave oil. Fokion Theodorou also runs a 4-star hotel in the Lesvos, utilizing the same concepts that he uses in Faena, of immersing guests in the rich environment of Lesvos (extensive traditional breakfast, participation in natural activities and festivals, local cuisine, traditional architecture). He also loves to read, travel and collect shaving products, old books and perfumes. Breakfast is early in the morning with his wife and young family. A cup of strong Greek coffee, some orange juice, along with some homemade orange marmalade or local honey on bread and some honey lukumades provide enough energy to start a busy day. When did you start Traditional Wet Shaving? Fokion was introduced to traditional wet shaving with a safety razor as an idea by a close friend, who is an avid wet shaver. He suggested that though the wet shaving community in Greece is in infant stage, it is very strong abroad, and it matches the ideas by Faena, which is to share experiences such as the superb, Greek and Lesvian shaving experience! The Faena brand is named after the ancient Greek godess 'Faena' as depicted by the logo. One of the 6 "charites", embossing ancient Greek fertility, beauty, graciousness, fame and wisdom. Faena symbolized beauty and luminosity, thus the brand aims is to provide excellent male grooming products that tend to the face and body. The luminosity and aroma of a clean face or body are integral to Faena shaving products. Fokion's favourite scents are tobacco-vanille and pergamot, he uses them daily in either his shaving soap, eau de perfume, or aftershave. He loves the sweet and strong scent of tobacco vanille in winter and pergamot brings him back memories of his childhood in the village, surrounded by citrus trees. Leather and marjoram are scents that he has been experimenting with but not used so far. Faena shaving soaps may require a good amount of water when lathering. 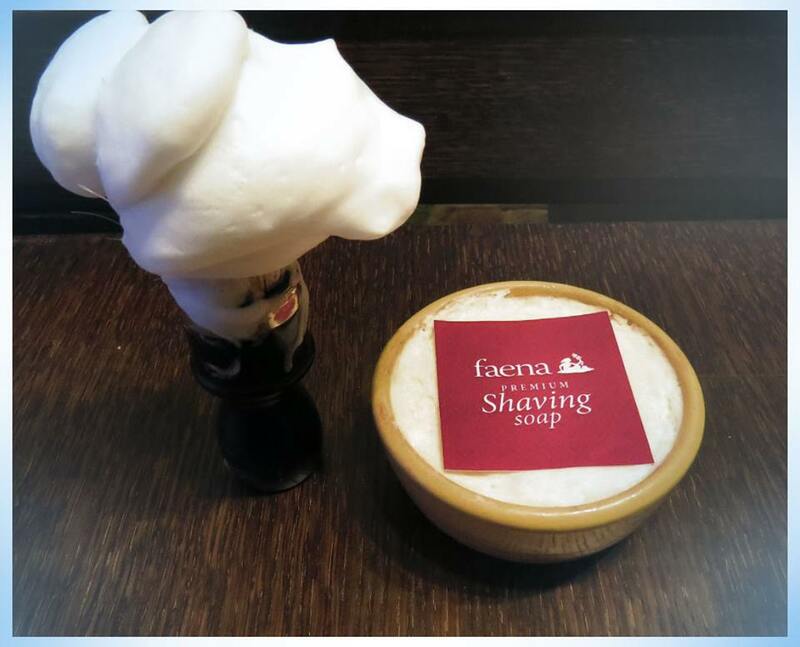 Agents observed that to achieve perfect lather, put soap bowl upside down, turn medium wet shaving brush till the watery lather disappears and then turn bowl around and turn brush some more, till thick lather is created. What is new from Faena in 2019? Faena now produce 4 Limited Edition Shaving Soaps each season, with only 30 shaving soaps on each batch. Each Limited Edition, will be a suggestion from a friend or family for their favourite scent. Faena Spring 2019 has just launched, with Agent Shave having just 6 uniquely numbered shaving soaps & balms. An ode to Creed, Green Irish Tweed with a fresh green fragrance of peppermint, lemon, sandalwood and musk. There are some changes to the Faena range in 2019. Sandalwood (Xylon) has sadly been discontinued. The aftershave splashes have also been discontinued, replaced entirely by the aftershave balm range, which is parabens and alcohol free. We do still have a small stock, however once these aftershave splashes are gone will no longer be available. We hope you enjoyed our undercover report into this fantastic Greek shaving brand and hope that we have introduced you to a new artisan range - happy shaving agents!